Pallet racks are essential to warehouses and retail centers, as well as to many industrial and commercial facilities. Regardless of the facility, all racks must be anchored for stability and security. There are several common types of pallet racks available, with each type designed for specific functions. Once the type of pallet racking has been determined, a floor plan must be designed to allow for adequate aisle spacing. If the storage space requires a tighter configuration, then pallet racking designed for narrow aisles is available. After the facility racking floor plan is designed and the racks are assembled, the decision to purchase the anchors to secure the racks to the concrete slab must be carefully considered. A vertical tolerance of 1/8" in 4 feet is generally accepted as level in most applications. It is critical to ensure that all of the racks are level before installing any anchors. It is also essential to ensure that every column of the rack frame will be anchored to an adequate and stable concrete floor. Deciding which anchor to use is typically based on the manufacturer's recommendation and/or personal preference. One option for fastening pallet racks is the use of a concrete wedge anchor. Wedge anchors are available in a variety of diameters and lengths and are specifically designed for use in solid concrete. The diameter to be used in each application is dependent upon the hole size in the bottom plate of the upright. Most racking systems have holes that will accommodate a 1/2" diameter wedge anchor. The 1/2" anchor is available in 8 different lengths ranging from 2 3/4" to 12". The most commonly used lengths for fastening pallet racks are the 3 3/4" and 4 1/4". Concrete strike anchors can also be used when anchoring warehouse pallet racks. 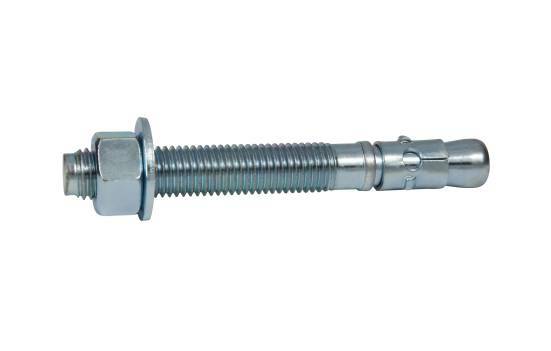 The strike anchor is designed for use in solid concrete and is an impact-expansion type anchor. 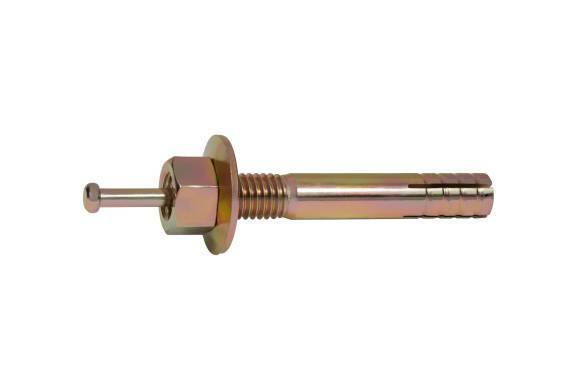 This 1/2" anchor is available in 4 lengths ranging from 2 3/4" to 6". The most common lengths used in this type of application are the 3 1/2" and 4 3/4". Another essential consideration is to determine the required holding values for the chosen anchor. Once the holding values are calculated and verified, refer to the wedge anchor technical specifications or strike anchor technical chart to select the size of anchor required. If unsure of the correct size anchor to use, it is recommended to check local building codes or have an engineer determine the requirements for the particular application. The pallet rack manufacturer may also suggest an anchor size to use. Using the hole in the bottom plate as a template, carefully drill holes using a hammer drill and carbide-tipped masonry bit. The drill bit diameter should be the same diameter as the wedge anchor. · Clear the holes of all debris using compressed air, a shop-vac or wire brush. · Before inserting the wedge anchor into the hole, be sure to place the washer and thread the nut a couple of turns. Not fully threading the nut protects the threads of the wedge anchor. · Insert the wedge anchors into each hole through the upright legs of the pallet racks. · Carefully hammer the anchors into each hole ensuring that they are installed to the desired depth. · Tighten all the nuts using a torque wrench to ensure they are tightened to the required torque value. · Wedge anchors are very effective when the concrete is in good condition and minimum edge distances and spacing are maintained. · Hole size is critical to the holding values of the wedge anchor. Hole diameter is equal to the anchor diameter when using ANSI standard carbide bits. The tolerances of the ANSI standard carbide bits are specifically matched to wedge anchor diameters. · Wedge anchors have a required torque value. See the technical information page to determine the diameter of the anchor to use for a range of required torque values. Using the hole of the bottom plate as a template, carefully drill your holes using a hammer drill and carbide-tipped masonry bit. The drill bit diameter should be equal to the strike anchor diameter. · Before inserting the strike anchor into the hole, be sure to place the washer and thread the nut onto the anchor as required. The nut may be flush with the top of the anchor or fully turned to provide a stud finish. · With nut, washer and set-pin securely in place, insert the strike anchors into each hole through the upright legs of each pallet rack. · Using a properly sized hammer, set the pin with several sharp and square strikes on the head of the pin until it is flush with the top of the anchor. The strike anchor is now properly set. For more detailed instructions, please view this strike anchor installation video. · Anchor size is equal to hole size. · The actual diameter of the anchor is the same as its nominal diameter. · Anchor is inserted with nut and washer attached. · The nut and washer can be easily preset for the desired embedment. · The strike anchor can be visually inspected after it is set. When the head of the pin meets the threads, the anchor is set. · Strike anchors provide excellent holding values. · Nuts and washers are included. It is important to install racks safely to reduce on-site injuries and improve productivity. Taking the time to research the specific application, as well as conferring with contracting experts, can create a more productive, effective warehouse.